Finally, the third post under the Article of the Week heading on the homepage will consist of additional material or media. This week we feature a video from Mr. Jim Adshead, discussing his paper. To evaluate postoperative health resource utilisation and secondary care costs for radical prostatectomy and partial nephrectomy in National Health Service (NHS) hospitals in England, via a comparison of robot-assisted, conventional laparoscopic and open surgical approaches. We retrospectively analysed the secondary care records of 23 735 patients who underwent robot-assisted (RARP, n = 8 016), laparoscopic (LRP, n = 6 776) or open radical prostatectomy (ORP, n = 8 943). We further analysed 2 173 patients who underwent robot-assisted (RAPN,n = 365), laparoscopic (LPN, n = 792) or open partial nephrectomy (OPN, n = 1 016). Postoperative inpatient admissions, hospital bed-days, excess bed-days and outpatient appointments at 360 and 1 080 days after surgery were reviewed. Patients in the RARP group required significantly fewer inpatient admissions, hospital bed-days and excess bed-days at 360 and 1 080 days than patients undergoing ORP. Patients undergoing ORP had a significantly higher number of outpatient appointments at 1 080 days. The corresponding total costs were significantly lower for patients in the RARP group at 360 days (£1679 vs £2031 for ORP; P < 0.001) and at 1 080 days (£3461 vs £4208 for ORP; P < 0.001). 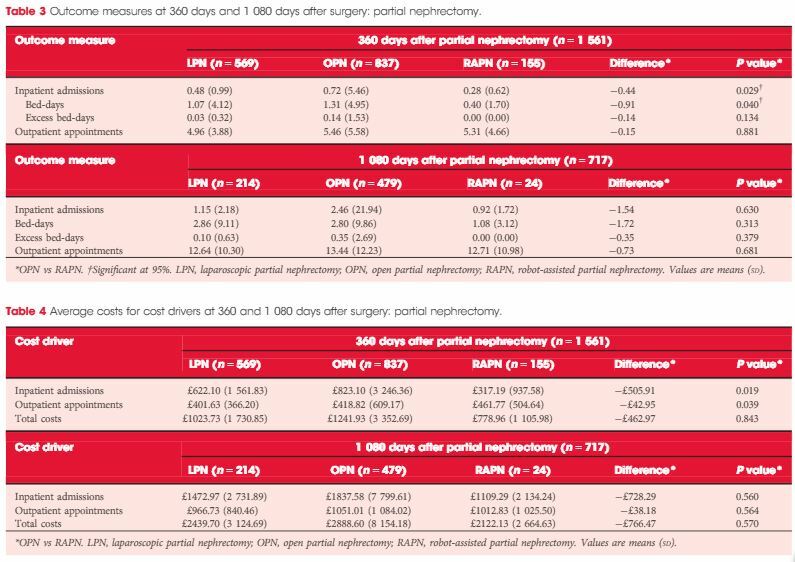 In partial nephrectomy, Patients in the RAPN group required significantly fewer inpatient admissions and hospital bed-days at 360 days compared with those in the OPN group; no significant differences were observed in outcomes at 1 080 days. The corresponding total costs were lower for patients in the RAPN group at 360 days (£779 vs £1242 for OPN,P = 0.843) and at 1 080 days (£2122 vs £2889 for ORP; P = 0.570). For both procedure types, resource utilisation and costs for laparoscopic surgeries lay at the approximate midpoint of those for robot-assisted and open surgeries. Our analysis provides compelling evidence to suggest that RARP leads to reduced long-term health resource utilisation and downstream cost savings compared with traditional open and laparoscopic approaches. 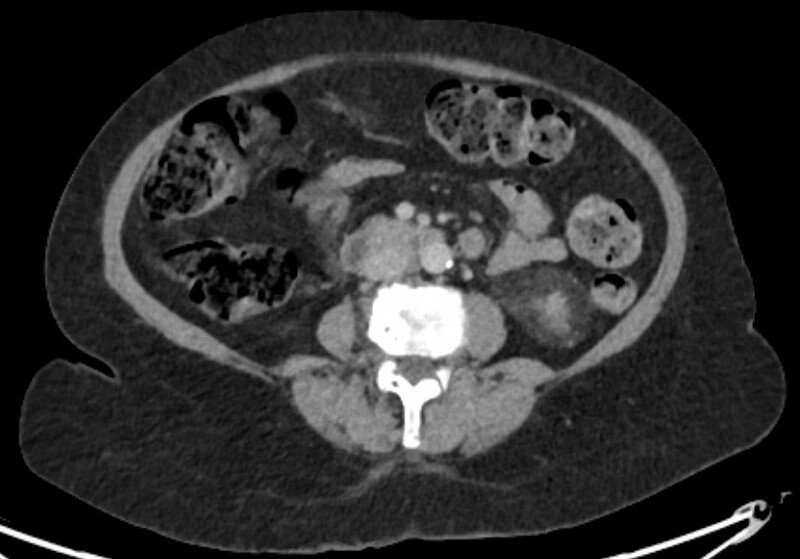 Furthermore, despite the limitations that arise from the inclusion of a small sample, these results also suggest that robot-assisted surgery may represent a cost-saving alternative to existing surgical options in partial nephrectomy. Further exploration of clinical cost drivers, as well as an extension of the analysis into subsequent years, could lend support to the wider commissioning of robot-assisted surgery within the NHS. Very nice analysis that adds to the literature on long-term cost analyses needed in MIS. Does the NHS dataset allow an analysis to focus on what particular complications or other divers of cost are making the difference? Second--does the savings noted make up for the upfront cost? HES data is quite granular and the majority of the drivers were urological re-interventions and infection\wound related issues. Like SEER it is based on coding which may not answer specific causes as readmissions are often grouped into general categories. 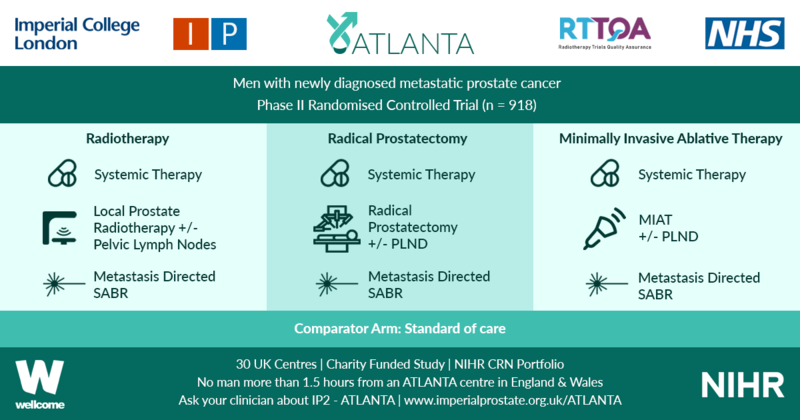 Regarding upfront costs, in the NHS it has been acknowledged that if an established RALP program is performing 150 prostatectomies per year then it is cost effective so if RAPN is performed on cost neutral systems then all other downstream benefits are savings.